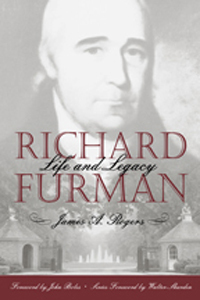 As traveling evangelist, advocate of religion freedom, leader of the patriot cause, Charleston minister, and pioneer educator, Richard Furman became a seminal figure in American religious history and a potent political force in South Carolina. From his conversion in 1770 Furman gave himself to study of the Bible and then to preaching. In 1774, at age 18, he was ordained to the Baptist ministry. He volunteered for military action in the American Revolution, but South Carolina leaders saw that he would be more valuable as a preacher than as a soldier. Lord Cornwallis was said to have feared the prayers of Furman more than the armies of Francis Marion and Thomas Sumter. After the revolution, as Baptist minister in Charleston, Furman began laying the foundation for an organized program of Baptist education and missions in the South and throughout the United States. By 1814, when he was elected president of the first Triennial Convention of American Baptists, he was perhaps the most influential Baptist leader in America and among the best-known Baptists in America and England.